There has been a huge amount of change in the refrigerants market over the last 30 years, as awareness of the environmental impact of certain families of products has lead to their phase out and replacement. This will, of course, have significant ramifications for the data center industry, which faces an ongoing challenge to remain as environmentally friendly as possible. 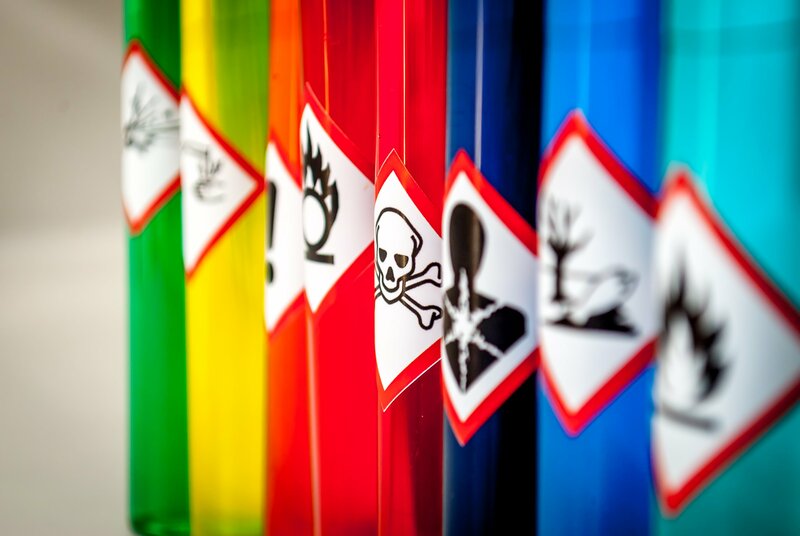 Chlorofluorocarbons (CFCs) were hailed as a great leap forward in the 1950s, when their non-toxicity and non-flammability offered what was seen then as a perfect alternative to older refrigerants such as sulphur dioxide and methyl chloride. Greater understanding of environmental issues in the 1970s identified CFCs as major contributors to the depletion of the ozone layer (the layer in the atmosphere that protects the Earth from harmful UV radiation). This lead to the Montreal Protocol agreement, which controlled and ultimately phased out CFCs and HCFCs in the 1990s. To replace CFCs and HCFCs, another family of fluorocarbons was developed; Hydrofluorocarbons (HFCs). Again, these were non-toxic and non-flammable, but also had a zero ozone depleting potential. These products are now widely used throughout the cooling industry. However, the growing focus on climate change and greenhouse gas emissions highlighted that HFCs are powerful greenhouse gases, with a high Global Warming Potential (GWP). As a result, further regulation has been introduced to phase down the use of these products, whilst other alternatives are developed. The issue for fluorocarbon options is that the choices are limited. Basically, for a fluorocarbon to have a low GWP the molecule must be unstable, and be able to break up quickly in the atmosphere. A consequence of this is that most low GWP fluorocarbons also exhibit a level of flammability; although much lower than the highly flammable hydrocarbons. It is worth noting that there are (and have been for many years) non-fluorocarbon refrigerants in wide use. Ammonia has been used as a refrigerant for over 150 years, and remains an excellent choice in applications where its toxicity and flammability can be dealt with. Equally, hydrocarbons (such as propane and butane) have been widely used in appropriate applications, even though they are highly flammable. Almost all domestic refrigerators and freezers sold in Europe have a hydrocarbon refrigerant in them. Carbon dioxide is growing in use, as the industry gets used to its much higher operating pressures. Most large new supermarkets now utilise CO2 in their refrigeration equipment. 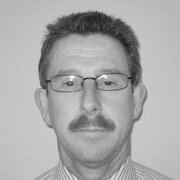 The main point that needs to be made is that most low GWP alternatives cannot be retrofitted into existing equipment; a fact that presents a major challenge to the industry. Firstly, there is a cap and phase down process. The capped volume for 2015 was based on average total sales for the period 2009-2012. This formed what is called the F Gas quota. Companies who could demonstrate their sales for the 2009-2012 period were then awarded an allocation from the quota on a pro rata basis. This quota is based on CO2 equivalent tonnes and not actual tonnes. As a result the actual amount of product companies can sell is linked to that product’s GWP. Basically, the higher the GWP of the refrigerant the fewer actual tonnes you can sell. This means it is vital that industry moves rapidly to lower GWP products. 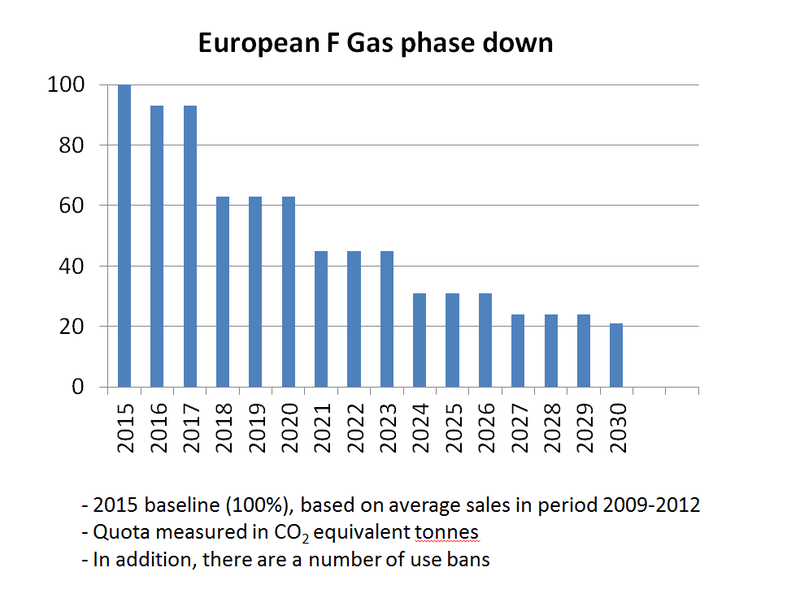 To phase down HFCs, the quota will reduce over time (see graph). So, in 2016 and 2017 the quota was reduced by 7 percent, but in 2018 the quota has reduced by 37 percent, which has had a dramatic effect on price and availability of HFCs. The phase down continues until 2030, when only 21 percent of the original total will be available. The second aspect of the F Gas Regulation is a series of use bans, which are aimed to eliminate the use of high GWP products quickly, and to reduce the overall GWP of refrigerants over time. These come into effect in the period 2020-2030. 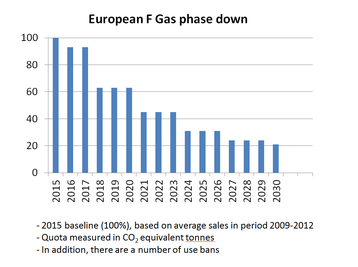 Whilst the F Gas Regulation is only applicable in Europe, the rest of the world has now agreed, and is ratifying, the Kigali Agreement, which basically mirrors the F Gas Regulation in having a global phase down and use bans. So how is this effecting industry? One of the largest consumers of refrigerant is the retail sector, and the product of choice here – R404A – also happened to have one of the highest GWPs – just under 4,000. As a result supermarkets have been under great pressure to move to lower GWP alternatives, and over the last few years they have been remarkably successful. As a result the spotlight has shifted to other refrigerants – most notably R410A (GWP = 2,088) which is widely used in air conditioning and chillers. As noted previously, the lowest GWP fluorocarbon refrigerants belong to a family called the fluoro propenes – now generally referred to as HFOs (Hydrofluoroolefins). Examples of these are R1234yf and R1234ze. This family of molecules offers GWPs in single figures, but are of low flammability. This has lead to a new refrigerant classification – A2L – to reflect the difference in flammability between these products and hydrocarbons – classified as A3. The difference in flammability characteristics means that there are differences in the charge size which can be safely used in a system. The refrigerant safety standard EN:378 allows users to calculate the safe charge size for a particular refrigerant, based on occupancy and access to a space. One of the biggest challenges faces the air conditioning industry. Put simply, there is no non-flammable alternative to their product of choice, R410A, which has been one of the main refrigerants used in data center cooling systems, along with R134a. This means a step change in thinking and behavior for everyone involved in the sector. Over the last couple of years a product has emerged as an R410A replacement. R32, ironically, is actually an HFC, but has a GWP of 675 (R410A is 2088). It is an A2L refrigerant, and hence its flammability must be taken into account when designing any system. A growing amount of equipment is now being produced for this refrigerant. What will shape the future for refrigerants will be down to regulation. The average GWP of refrigerants will need to get down to something like 400 to ensure that the F Gas Regulation phase down is adhered to. As we have seen, this means the majority of refrigerants in use will exhibit flammability to a greater or lesser extent. This in turn will require standards to evolve to ensure the safe use of these products. It should not be overlooked that technology developments will also play their part. Evaporative cooling, which does not require the use of refrigerants, has been used effectively in many applications and is particularly suitable for data centers in dry climates, as it is easier for moisture to evaporate in areas of low humidity. The use of non-compressive technologies is being looked at using liquid nitrogen. Who knows what other technologies may be developed? They will be needed as there is no doubt that the world will need a growing amount of cooling as time goes on. So, when we talk about refrigerants and refrigeration we can truly say there is nothing constant but change.